DNA immunoprecipitations were performed with 1 μg of genomic DNA from NCCIT cells and either 10 μl of 5-Methylcytosine (5-mC) (D3S2Z) Rabbit mAb #28692 or 10 μl of Rabbit (DA1E) mAb IgG XP® Isotype Control (DIP Formulated) #75708 using SimpleDIP™ Methylated DNA IP (MeDIP) Kit #76853. The enriched DNA was quantified by real-time PCR using human Aqp2 intron 5 primers, human TIMP3 promoter primers, SimpleDIP™ Human Testis-Specific H2B Promoter Primers #65822, and SimpleChIP® Human GAPDH Exon 1 Primers #5516. The amount of immunoprecipitated DNA in each sample is represented as signal relative to the total amount of input DNA, which is equivalent to one. DNA immunoprecipitations were performed with 1 μg of genomic DNA from mouse embryonic stem cells and either 10 μl of 5-Methylcytosine (5-mC) (D3S2Z) Rabbit mAb #28692 or 10 μl of Rabbit (DA1E) mAb IgG XP® Isotype Control (DIP Formulated) #75708 using SimpleDIP™ Methylated DNA IP (MeDIP) Kit #76853. The enriched DNA was quantified by real-time PCR using mouse Aqp2 exon 1 primers, SimpleDIP™ Mouse Intracisternal-A Particle (IAP) LTR Primers #74803, mouse Lamc3 exon 1 primers, and SimpleChIP® Mouse GAPDH Intron 2 Primers #8986. The amount of immunoprecipitated DNA in each sample is represented as signal relative to the total amount of input DNA, which is equivalent to one. 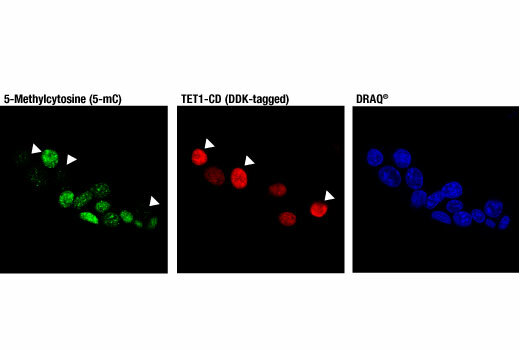 Confocal immunofluorescent analysis of 293T cells transfected with a construct expressing DYKDDDDK-tagged TET1 catalytic domain (TET1-CD) using 5-Methylcytosine (5-mC) (D3S2Z) Rabbit mAb (green) and DYKDDDDK Tag (9A3) Mouse mAb #8146 (red). Blue pseudocolor = DRAQ5® #4084 (fluorescent DNA dye). As expected, 293T cells expressing TET1-CD (red) exhibit decreased levels of 5-methylcytosine (green). 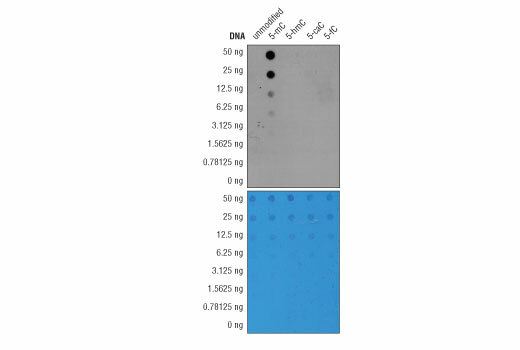 DNA fragments from HCT 116 wild type (WT) and DNMT1/DNMT3B knock-out (KO) cells were blotted onto a nylon membrane, UV cross-linked, and probed with 5-Methylcytosine (5-mC) (D3S2Z) Rabbit mAb. The top panel shows the antibody detecting more methylated cytosine in the wild type cells, while the bottom panel shows the membrane stained with methylene blue. 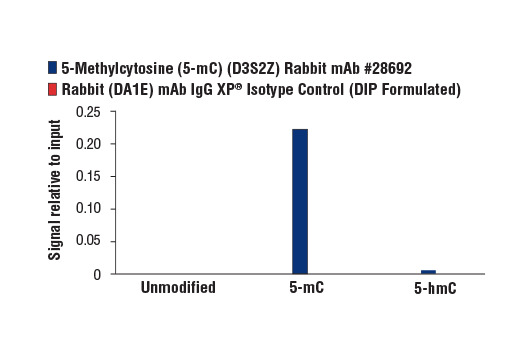 The specificity of 5-Methylcytosine (5-mC) (D3S2Z) Rabbit mAb was determined by dot blot. The same sequence of a 387 base pair DNA fragment was generated by PCR using exclusively unmodified cytosine, 5-methylcytosine (5-mC), 5-hydroxymethylcytosine (5-hmC), 5-carboxylcytosine (5-caC), or 5-formylcytosine (5-fC). The respective DNA fragments were blotted onto a nylon membrane, UV cross-linked, and probed with 5-Methylcytosine (5-mC) (D3S2Z) Rabbit mAb. The top panel shows the antibody only binding to the DNA fragment containing 5-mC, while the bottom panel shows the membrane stained with methylene blue. 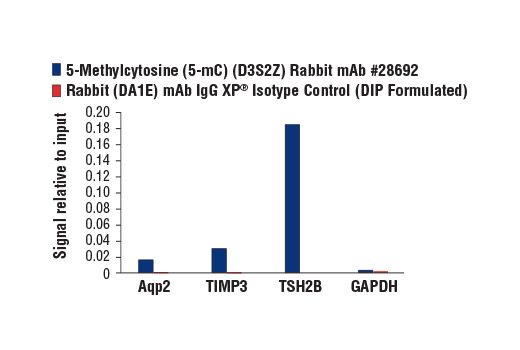 The specificity of 5-Methylcytosine (5-mC) (D3S2Z) Rabbit mAb was determined by ELISA. The antibody was titrated against a single-stranded DNA oligo containing either unmodified cytosine or differentially modified cytosine (5-mC, 5-hmC, 5-caC, 5-fC). 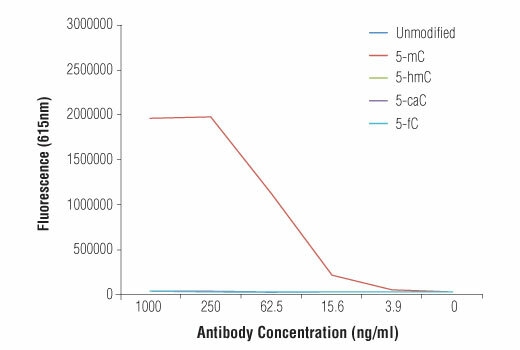 As shown in the graph, the antibody only binds to the oligo containing 5-mC. The specificity of 5-Methylcytosine (5-mC) (D3S2Z) Rabbit mAb was determined by DNA immunoprecipitations. DNA IPs were performed with genomic DNA prepared from mouse embryonic stem cells, spiked with control DNA containing either unmethylated cytosine, 5-methylcytosine (5-mC), or 5-hydroxymethylcytosine (5-hmc). 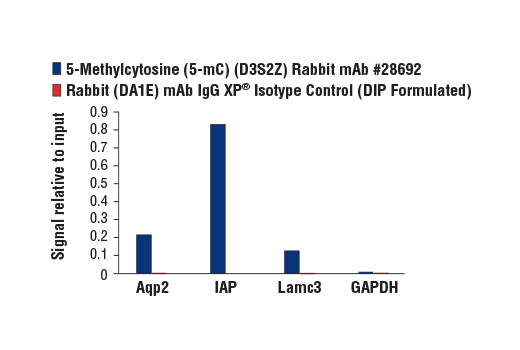 IPs were performed using 5-Methylcytosine (5-mC) (D3S2Z) Rabbit mAb and the SimpleDIP™ Methylated DNA IP (MeDIP) Kit #76853. The enriched DNA was quantified by real-time PCR using primers specific to the spiked-in control DNA sequence. The amount of immunoprecipitated DNA in each sample is represented as signal relative to the total amount of input DNA, which is equivalent to one. 5-Methylcytosine (5-mC) (D3S2Z) Rabbit mAb recognizes endogenous levels of 5-methylcytosine. This antibody has been validated using ELISA, dot blot, and MeDIP assays and shows high specificity for 5-methylcytosine. Monoclonal antibody is produced by immunizing animals with 5-methylcytidine. Normally DNA methylation occurs in a bimodal fashion, such that CpG dinucleotides are largely methylated across the genome, except in short stretches of CpG-rich sequences associated with gene promoters, known as CpG-islands, where methylation is virtually absent (8). Cancer cell genomes often undergo global hypomethylation, while CpG-islands become hypermethylated, causing their associated promoters to become repressed (9). There is evidence that a number of aberrantly hypermethylated CpG-islands found in carcinomas occur at tumor suppressor genes such as RB1, MLH1, and BRCA1 (10).